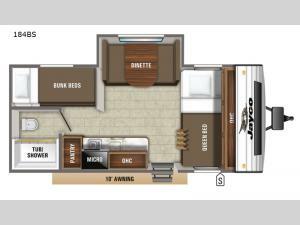 Get ready for a great vacation every time you hitch up this Jay Flight SLX 7 travel trailer to your tow vehicle! Model 184BS has all of the comforts you want and need while you travel. 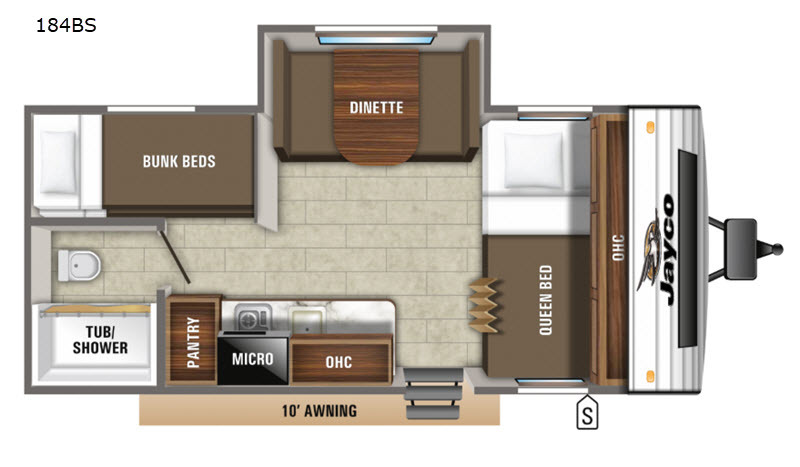 With a set of bunk beds and a queen bed you can easily sleep four, and the slide out dinette offers sleeping for one or two more depending on whether an adult or child! You can easily grab a bite to eat when inside with the adequate kitchen appliances. Pop a quick snack in the microwave oven, or heat up something easily on the two burner range. When outside, you will love the 10' power awning for a bit of shade during the high afternoon sun, and at night enjoy an evening of entertainment with the LED lights turned on. This Jay Flight SLX 7 model 184BS also provides you with a standard wall-mount or optional roof mount AC so you can be comfortable no matter how warm it is outside!